New England Clam Chowder Recipe with Fresh Steamed Clams – This delicious New England Clam Chowder recipe is jam packed with vegetables and fresh steam clams for the most amazing soup ever! I am back, and in my fanciest Boston fishmonger shellfish digging outfit fully equipped with hipster sweater, denim apron and of course a beanie for my dome to whip up this New England clam chowder! Not only was it fashionable it was also incredibly functional making thisNew England clam chowder recipe because outta nowhere winter has most recently smacked us here in Chicago as it’s gone from 75° to 35°. There is literally no fall, no spring, only summer or winter. Yeah NOT funny to the outsiders lemme tell you. So, as I was saying now that I’m nice and toasty on this cold day, it’s time to bust out a way oversized pot of New England Clam Chowder. Truth be told I’ve been trying to go back through my website to redo some stanky hideously old pictures and recipes that are in some major need of updating, like this New England clam chowder. A lot of these recipes are 8 years believe it or not that carried over from my first site, fixmyrecipe.com back in 2009. That’s right, I’ve been showing this mug on camera for over 8 years now… Thanking God every day that I still get to do what I love. Ok enough with the blabbering, let’s get into this New England Clam Chowder Recipe. What is New England Clam Chowder? Ok wait, one more… Name this movie! “New England Clam Chowder… Is that the white or the red? No, it’s not from Greatest Catch, it’s from Ace Ventura Pet Detective when Jim Carrey was trying to meet up with his buddy who set up shop in an underground room at a heavy metal club. I only tell you all of this because New England clam chowder is white and the folks down south in Manhattan make the red chowder, just in case there were any hang ups. Both clam chowders are actually made pretty similarly except in the red there is no cream, and there is an addition of tomatoes. I think both are delicious but if I had to choose I’d go with the white New England clam chowder because it’s soup so it’s hot and meant to eat in cooler weather, plus the cream makes it a bit heartier. New England clam chowder starts with some bacon, so I went all in with 1 pound of super thick cut smoked bacon. I know it seems like a lot but I literally made 2 gallons of soup – sorry I’m Italian and it’s in our blood to try and feed the neighborhood in addition to our families. Cook the bacon until the lardons are crispy brown and the fat is rendered. You can also remove a ½ cup of the bacon fat just to be safe as well, as there is no need to make an overly fattyNew England clam chowder recipe. From there you want to set the bacon aside and sweat your vegetables. It’s ok if the onions caramelize a bit here you really just want to make sure they are tender before adding in the flour to your New England clam chowder. It’s important to make a roux at this point in the New England clam chowder because this is what will thicken it up. Roux is equal parts weight fat and flour and doing this makes it hard to gauge because I really have no clue how much 1 pound of rendered bacon fat weighs, but after it was said it done it ate up 1 ¼ cups of flour. I’ve been doing this long enough that I know when a roux is good to go. If for some crazy reason your New England clam chowder does not get thick when it comes to a boil make a slurry, which is corn starch and water mixed together, and mix into your soup. That is a total worst-case scenario, but wanted to provide it just in case because you never know. Once your roux is made, add in the cream sherry and then your stocks, clams and herbs to the clam chowder soup. Bring this sucker to a boil to ensure it becomes nice and thick before adding the potatoes in and cream. Season it up and then cook up the fresh steamed clams! Making fresh steamed clams is actually really easy. Add some olive oil to a pan and add your clams and saute for a few minutes. Next, hit it with the wine, garlic and thyme, and put a cap on it and boil the clams until they open. That’s how you know they are done. Finish it with butter, parsley, salt and crushed red pepper flaks and serve’em up all over top of this New England Clam Chowder Recipe! If you love my New England Clam Chowder Recipe then you’ll love these soup recipes! When it's cold out then it's soup time in my house, and this huge pot of New England Clam Chowder with Fresh Steamed Clams hit the spot! In a very large pot over medium heat, render the bacon. Once brown remove the bacon and about ½ cup of the bacon fat. Add in the onions, garlic and celery and sweat for 5 to 6 minutes. Next pour in the sherry, clams, clam stock, chicken stock and bay leaves and bring to a boil or until thick. Once thick, add in the potatoes, thyme, cream, ½ of the cooked bacon and seasonings and simmer over low heat for 25 to 30 minutes or until the potatoes are tender. Keep warm. Clams: Add oil the a medium size saute pan over high heat and add in the clams and cook for 1 to 2 minutes. Flames may appear as there will be water leaking out from the clams into the oil – turn down the heat if this happens. Add in the wine, garlic and thyme and cover and cook for 3 to 5 minutes on high heat or until the clams open. Finish the clams with butter, parsley, salt and red pepper flakes. 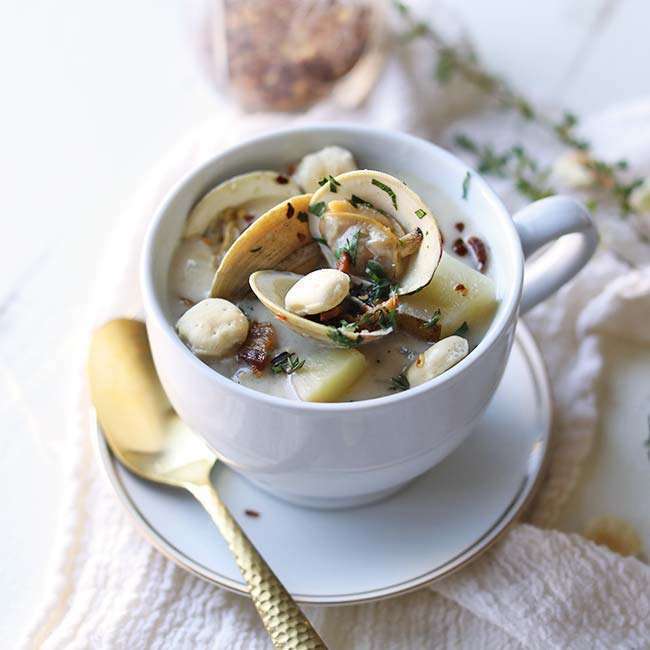 Pour a bowl of chowder and garnish with cooked clams, fresh thyme leaves, chopped parsley, cooked bacon, oyster crackers and red pepper flakes. Amazing recipe! Easily the best clam chowder I’ve ever had. Thanks for sharing the recipe.